I am so excited to be taking part in the How To Decorate Series hosted by Beth at Home Stories A to Z! 25 fabulous bloggers are participating in this series, and I am honored to be bringing up the tail end...last the best of all the game. Lol! But seriously, if you want some amazing decorating inspiration, make sure and start at the beginning on Beth's blog and follow all the way through! If you've been following along, and are just joining me from my friend Brooke at All Things Thrifty, welcome! I'm glad to have you here!! The problem with being the last post out of 25 amazing bloggers, is trying to come up with a topic that is fresh and that hasn't been addressed already. But then I got to thinking and decided that talking about how to make a rental (or any space for that matter) your own is the perfect topic. For the past 5 years, I have been living in rental spaces. Two of them. One that I couldn't do anything to, and one that I have had the luxury of painting, but that I still couldn't change any of the major finishes in the space. Both have taught me some valuable lessons that I want to share. Regardless of whether or not we rent or own, we do not always have the luxury of being able to change the things we aren't happy with. Whether it is because we are renting and can't change things contractually, or whether we own but can't afford to make the changes we want to make, we don't always have exactly the space we want. So in this post, I want to address ways to make a space your own without making permanent or costly changes. It is possible! 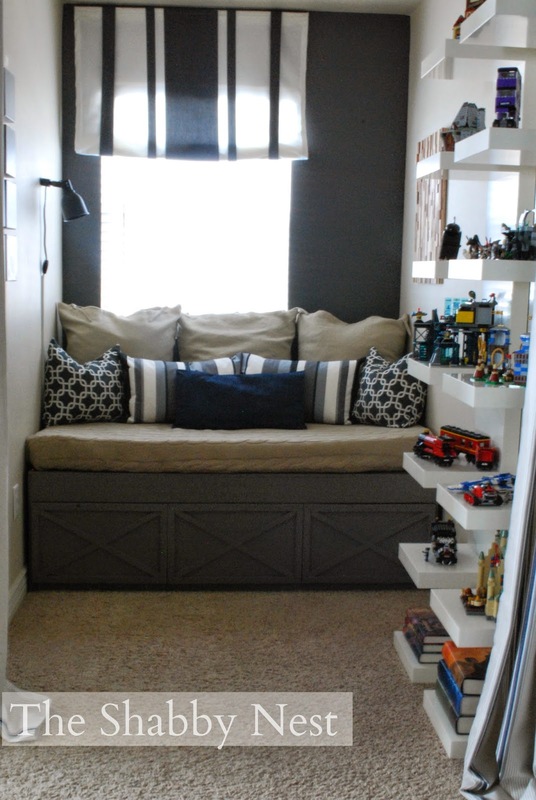 Finding unique and creative solutions to space issues is a great way to make a space your own. For instance, in the house we currently live in, we are lacking bedroom space. 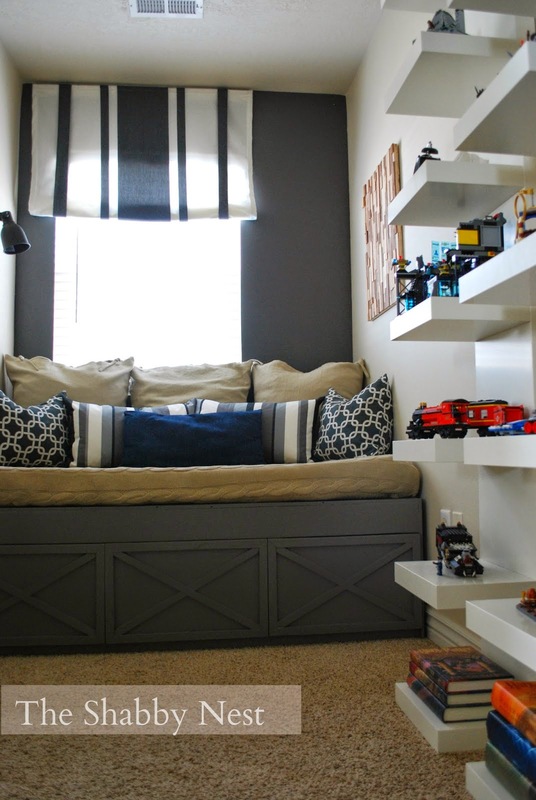 By utilizing a funny little loft space, I created a cozy bedroom for my youngest son. 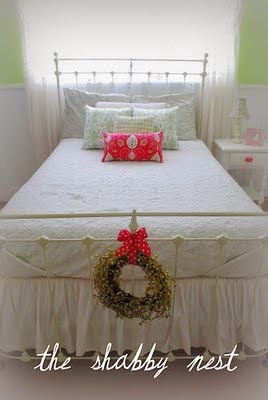 The bed looks like a built-in, but it's not...it's a DIY piece we created to look like a built-in. Curtains hanging from the ceiling provided need privacy. The rental house we lived in previously desperately needed a mudroom. I created a space by removing an awkward door - but leaving the hinges so it could be re-attached - between the back entry and the kitchen and turning it into what I affectionately refer to as the "makeshift mudroom". And what appears to be wallpaper is actually just wrapping paper that I stapled (yes, stapled!) to the wall. Another idea to make a space your own is to add your favorite colors. What if you can't paint? Easy! Add color with your furniture and accessories! The bedrooms that my daughter has lived in in both of our rental houses illustrate this point perfectly. In the first house, the walls were already painted a very vibrant apple green. This was not the exact color my daughter would have asked for, but we made it work by bringing in her favorite color (PINK!) 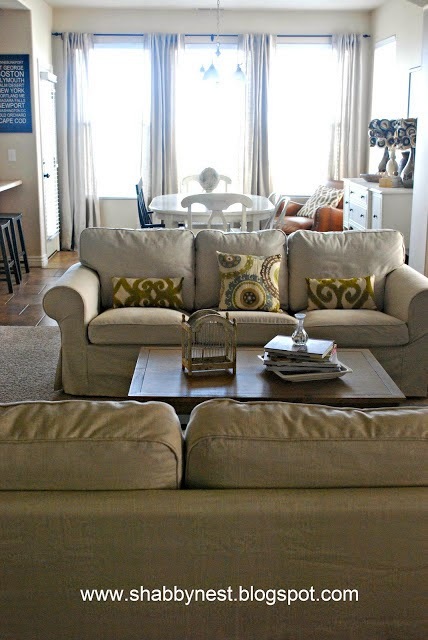 with accessories on neutral white furniture. 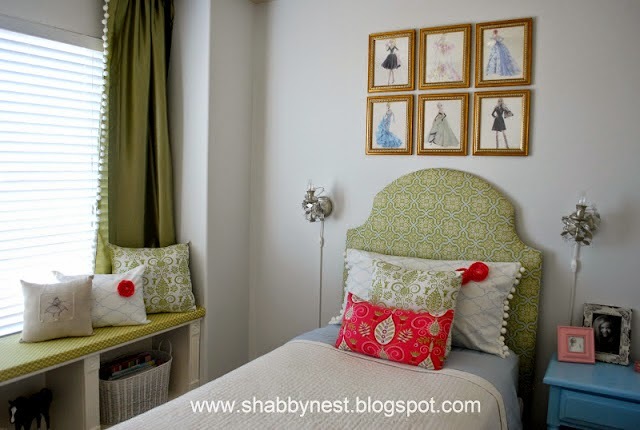 In the bedroom she currently has, we used the green and pink pillows I had sewn for her previous bedroom as a jumping off point to add color through a DIY upholstered headboard, window seat and more pillows! but roman shades (of the non-custom variety) are also a great option. Wherever you live, invest a bit of time in creating a haven. 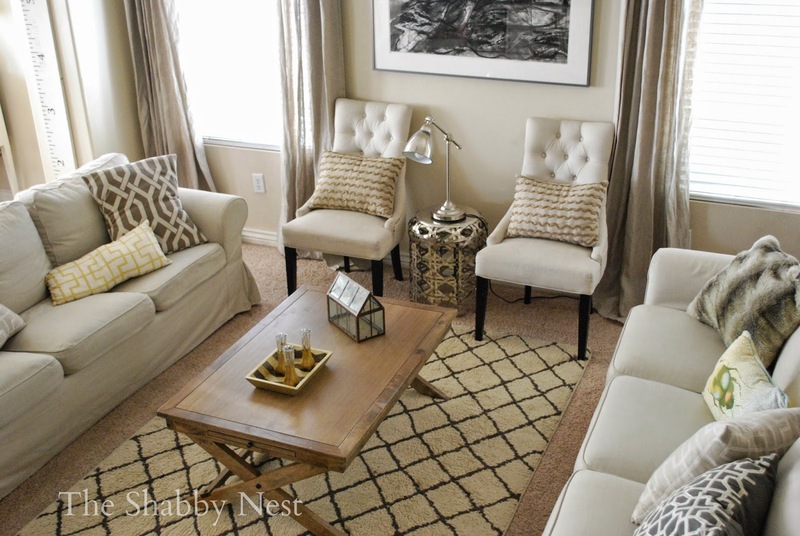 Our homes are a very important aspect of our family life. They are places that our children, our families and our friends will create memories that last a lifetime. They should be places of joy and contentment, so why not do our best to make them beautiful and to make them a reflection of who we are as individuals and as families? Love your home and how you have used color and pattern to make it uniquely yours. Great post and full of fabulous information.